Everyone has a story to tell, cherished moments and days you will always remember forever.Share your special day with your family and friends to remember. We take pride in providing beautiful photos taken in the gorgeous Okinawan paradise through our professional photographer and makeup artist worldwide. Get ready to celebrate your story! 〒900-0115 1F Seaside, 9-8 Mihama,chatan-cho, Nakagusuku-gun,Okinawa. *Payment must be done through the bank account at least 10 days prior to your event. Share your special day with your family and friends to remember. Meet us at the studio. Hair and makeup. Requesting a hair style is accepted, bringing a picture of an example of the hair style recommended. Photo shoot at Cape Manza or ANA Inter Continental Manza Beach Resort. Head to the Chapel. Makeup touch-up and changing the dress in the vehicle. 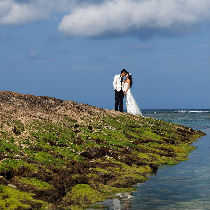 Photo shoot at Coralvita Chapel or Aqua Luce Chapel, and at the beach by the chapel. Makeup touch-up and change the dress in the studio. Photo shoot in Chatan area and at the beach near the chapel. head back to the studio and change clothes. ※Schedule is subject to change.